Let&apos;s start with the concepts of computer programming: computer programs, algorithms, programming languages, code compilation and execution. Watch a video lesson about the concepts of programming, programs, compilers and interpreters here: https://youtu.be/U16C61p6m1k. What It Means "To Program"? To program means to give commands to the computer, for example "to play a sound", "to print something on the screen" or "to multiply two numbers". When the commands are one after another, they are called a computer program. The text of computer programs is called a program code (or a source code, or even shorter – code). 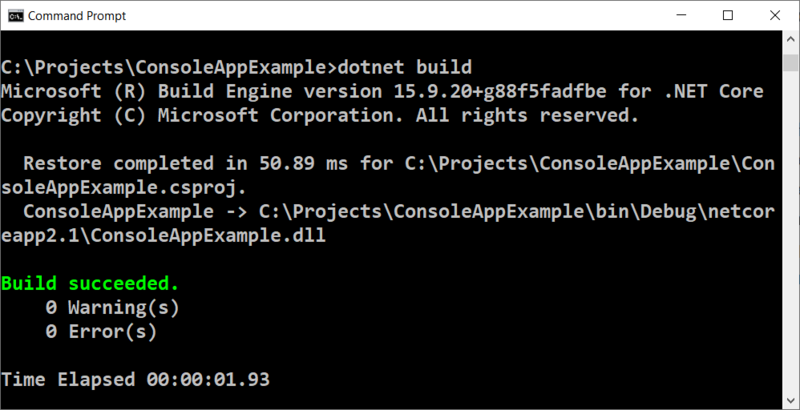 Run the above code example: https://repl.it/@nakov/welcome-to-coding-csharp. Run the above code example: https://repl.it/@nakov/square-area-csharp. We shall explain in detail how to write programs in C#, why we need to define a class and why we need to define a method Main() a bit later. Now, assume that the C# language requires all the above code in order to execute a sequence of command. In order to write commands, we should know the syntax and the semantics of the language which we are working with, in our case – C#. Therefore, we are going to get familiar with the syntax and the semantics of the language C#, and with programming generally, in the current book, by learning step by step code writing from the simpler to the more complex programming constructions. Computer programs usually execute some algorithm. Algorithms are a sequence of steps, necessary for the completion of a certain task and for gaining some expected result, something like a "recipe". For example, if we fry eggs, we follow some recipe (an algorithm): we warm up the oil in a pan, break the eggs inside it, wait for them to fry and move them away from the stove. Similarly, in programming the computer programs execute algorithms: a sequence of commands, necessary for the completion of a certain task. For example, to arrange a sequence of numbers in an ascending order, an algorithm is needed, e.g. find the smallest number and print it, then find the smallest number among the rest of the numbers and print it, and this is repeated until there are no more numbers left. 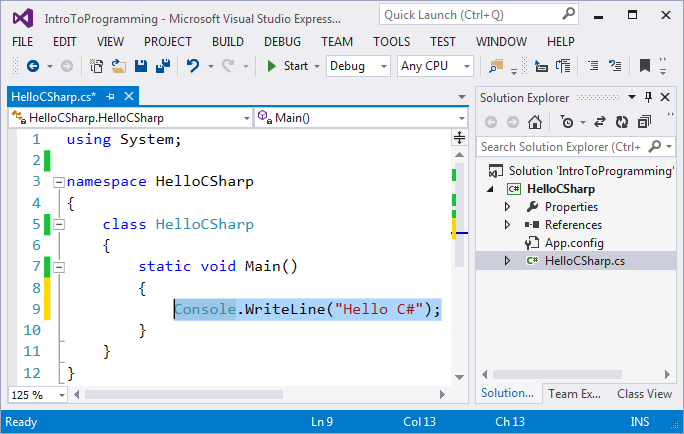 For convenience when creating programs, for writing programming code, for execution of programs and other operations related to programming, we need a development environment, for example Visual Studio. Let&apos;s review some concepts from computer programming: programming languages, compilers, interpreters and development environments (IDEs). An environment for development (Integrated Development Environment – IDE) is a combination of traditional tools for development of software applications. In the development environment we write code, compile and execute the programs. Development environments integrate in them a text editor for writing code, a programming language, a compiler or an interpreter and a runtime environment for executing programs, a debugger for tracking the program and seeking out errors, tools for user interface design and other tools and add-ons. Environments for development are convenient, because they integrate everything necessary for the development of the program, without the need to exit the environment. If we don&apos;t use an environment for development, we will have to write the code in a text editor, to compile it with a command on the console, to run it with another command on the console and to write more additional commands when needed, which is very time consuming. That is why most of the programmers use an IDE in their everyday work.